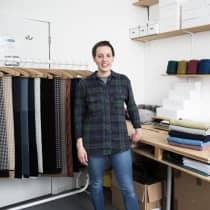 Nestled amongst the streets of Glasgow's creative West End, knitwear studio Jennifer Kent was founded by the eponymous Jennifer as a space to showcase her minimalist knits. All of her clothing is designed in the studio and produced in Scotland using only time-honoured manufacturing techniques. Visit her store and you'll also find a selection of carefully curated books, accessories, stationery and art by a range of creative talents. "I think the future of retail will be about memorable, personalised experiences. I hope that customers leave my shop feeling inspired."